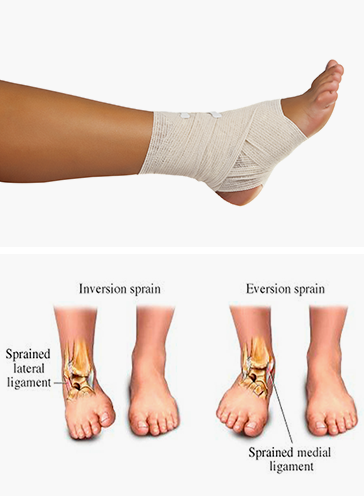 Inversion Ankle Sprains: The inversion ankle sprain is Inversion Ankle Sprain the most common type of ankle sprain. It occurs when the foot is inverted or rolled inward. When this type of ankle sprain happens, the outer, or lateral, ligaments are stretched too far. About 90% of ankle sprains are inversion injuries. Pain is always on the outside of the ankle, and there is usually no pain on the inside of the ankle joint. Eversion Ankle Sprains: The other type of sprained Eversion Ankle Sprainankle is called an eversion sprain, where the foot has been twisted outwards. When this occurs, the inner ligament, called the deltoid ligament, is stretched too far. Patients will have pain on the inner side of the ankle. If you present with significant symptoms following what is believed to be an ankle sprain it’s best to seek medical attention. Ankle Sprains that occur often can usually be attributed to a biomechanical nature and can be corrected with orthotics.